Ludwig's 100-year-old reputation has not been tarnished by the Epic Kit, which sits proudly in today's sub-£1000 bracket. The shells, with their birch/ maple combination, offer a different take on the hybrid option which is currently proving so popular. Well designed and solidly made. Good value, especially considering the free tom. The heads, as ever, might need upgrading. The standard sizes might not suit everyone. Ludwig's illustrious 100 year history is reflected in the design of the Epic's Classic Keystone lugs. Ludwig is one of the most recognisable brands in the history of drum manufacture, with many a great player having plied their trade behind a Ludwig kit. This year marks the company's 100th anniversary and the centenary is being celebrated with the launch of a host of new lines. Their latest kit is from the Epic series. 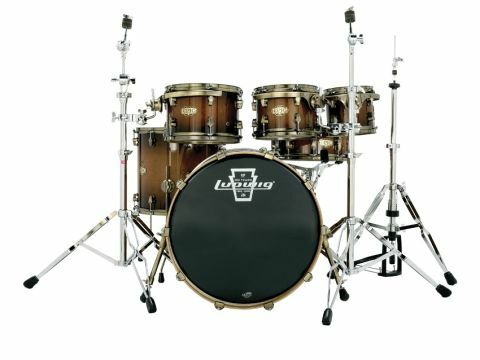 Ludwig's product portfolio features no less than nine different ranges of kits, with the Epic series being located at number three on the list. Slotting in below the Centennial series but above the Element and Accent ranges, the Epic series is split into two sections: Epic Standard, which offers five shellpacks, and Epic Modular, which contains only one kit. Our review kit is an Epic Standard Funk kit. Although five kit options sounds restrictive, Epic Standard kits cover a wide variety of diameters, with bass drums in 18", 20", 22" and 24" sizes. The Funk kit is made up of a 22"x20" bass drum, 14"x5" snare, 10"x7 1/2" and 12"x8" rack toms and a 16"x15" floor tom. Full marks for noticing that the kit pictured totals six drums - the extra 8"x7" rack tom is part of a promotion called '6/4/5' that Ludwig is running while stocks last. Anyone buying a five-piece Epic Standard shellpack will find a sixth tom thrown in for nothing. As a five-piece, the kit is already competitively priced so the gratis tom brings further value. Epic drums are made in China in a dedicated Ludwig manufacturing facility alongside Element and Accent kits. Epic Standard drums feature hybrid birch and maple shells. Snares and bass drums are 8-ply, with birch making up the two outer and inner plies. In between the birch is a 4-ply central section of maple. The toms are six plies thick and are made with a similar sandwich of two outer and inner birch plies framing two middle plies of maple. While there is no shortage of hybrid-shelled drums on the market, recent trends have seen exotic woods being paired with more everyday drum staples (such as bubinga and birch). There are very few examples of birch/maple shells in production, so Ludwig is clearly coming at hybrid shells from its own angle. Maple and birch are often defined by what separates them (in terms of sound characteristics) and tend to be presented as opposing choices of drum material. Combining them seems like a reasonable idea, assuming that their pooled strengths are greater than their constituent parts. By contrast, Epic Modular drums are made exclusively from birch, though they follow the same overall ply thicknesses as Epic Standard. The only Epic Modular kit currently available is a novel seven-piece shellpack that features two 20"x8" twin kick drums that can be used individually or joined together to make one longer drum. Without seeing the kit first hand it's hard to decide whether it's a work of genius destined to be widely imitated or an eccentric one-off. Epic Standard kits come in a choice of four glossy lacquer finishes. The Natural/Black Burst of the review kit hits the spot technically and is aesthetically pleasing as well. It is complemented by bronze-coated Vintage hardware fitted as standard. Classic Keystone lugs - an amalgamation of Ludwig's famous lug design with the company's old-school Keystone badge - are another distinctive touch. At the point of shell contact the lugs become thoroughly 21st Century, with a bridge-style design that arches between the shell fixings. The three rack toms are hung using Ludwig's Vibraband mounts which, in keeping with the lugs, are bronze-coated - as are the 2.5mm hoops found across the kit. Ludwig has persuaded some of its endorsees to take an Epic Standard kit out on the road in place of their usual Ludwig drums and their unanimously positive findings can be found on Ludwig's website. The shells are well made - thin, light and with bearing edges cut sharply enough to make you take care when running your finger around them. The 'Funk' designation refers to the modern exponents of the genre, so it's more of a 'pocket' kit than anything you might find on a classic James Brown recording. Essentially it's a punk-style four-piece with an additional pair of smaller toms. Considering the dimensions of the bass drum we expected an aggressive response, and that's what we got. In fact it did just what you would imagine an undrilled 22"x20" drum would - give a thunderously deep blast of near sub-frequencies with each stroke. "Ludwig has persuaded some of its endorsees to take an Epic Standard kit out on the road, to unanimously positive findings"
If all you require from your kick drum is a shuddering detonation of low end then it's perfect. If however, you're looking for a little more versatility, then this sort of drum is not ideal. To be fair, Ludwig is not the only manufacturer making bass drums of this nature, but one of the other Epic shellpacks features a 24"x14" kick, which would make a refreshing change. The 14"x5" snare was a fabulous drum - crisp, incisive and yet full bodied. Tuned up, it sliced across beats with ease, giving a hint of woody warmth behind its undeniable 'oomph'. Rimshots were received enthusiastically and reproduced with stinging authority. Lower down the tuning range it was equally adept and also performed well in quieter moments. In isolation the toms were bright, warm and evenly spaced, but in the context of the kit some were more audible than others. The 12" rack and 16" floor toms held their own against the bass drum and snare, but the two smaller toms were a little removed from the rest of the kit. The contrast with the kick drum was most obvious, as it was so deep and loud that it all but eclipsed the 8" drum. Fitting Remo coated Ambassadors brought an improvement, fleshing out the sound of the toms and helping them compete against the might of the kick.